Furnaces are among the most crucial components in the glass and metallurgical industry. Nowadays, furnaces are being operated at higher temperatures and for longer periods of time thus increasing the rate of wear on the furnace refractory lining. Consequently, there is a great need for a nondestructive tool that can accurately measure refractory wall thickness at high temperatures. 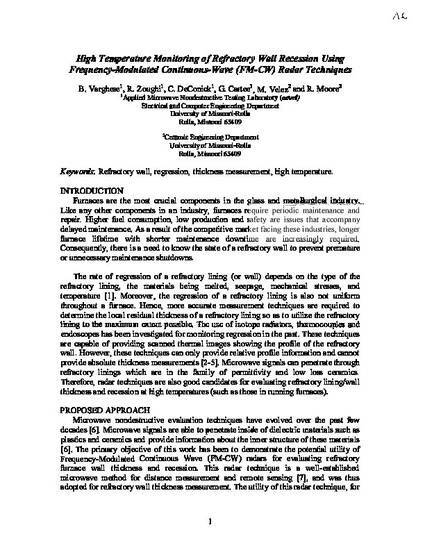 In this paper the utility of a frequency-modulated continuous-wave (FM-CW) radar is investigated for this purpose. © 2005 American Institute of Physics (AIP), All rights reserved.